Kosmas has played a leading role on the Czech book market for several years now. It was founded in 1999 and over the course of the past years it has acquired a stable position. The company currently has more than 80 employees, 12 of whom are sales representatives. In order for it to be able to offer customers better and faster services, the company moved in 2005 to new offices and storage premises in Horoměřice (Prague - West). Kosmas's wholesale range consists of more than 20,000 titles from more than 400 publishers. Kosmas has exclusive distribution rights for books produced by 30 publishers (for example, Argo, Torst, Paseka, Gallery, etc.). The range focuses mainly on quality works of fiction, history, children's literature, social sciences, architecture, design and art (including exhibition catalogues), philosophy, religion and spiritual teachings, esoteric literature, alternative culture, etc. The range also includes literary and cultural magazines. Kosmas supplies books to more than 800 bookshops throughout the Czech Republic, including both large chains of stores and also small specialist bookshops. It is a major supplier to general, as well as specialist and university, libraries. Its customers also include a number of non-bookstore retailers - gallery shops, esoteric stores, tearooms, newsagents, etc. In 2006 Kosmas began its on-line B2B ordering system (www.b2b.kosmas.cz). As well as being a convenient way of ordering books it provides an up-to-date summary of books that have already been published and also books that are being prepared for publication, as well as detailed information about individual titles, including monitoring of book reviews. Kosmas provides the publishing houses that it represents with a number of marketing channels in order to promote their titles. It issues a printed monthly publication entitled "Knižní noviny" ("Book News") intended for booksellers and their customers. This has a circulation of 20,000 and is free. Kosmas also presents new books through an information service for the media, by participating on radio programme about literature and with advertisements in the specialist press. 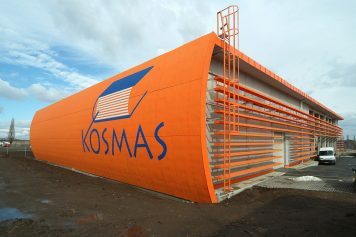 As well as its wholesale activities Kosmas also owns its own retail network. This includes 33 high street bookshops and the on-line Kosmas.cz bookshop (www.kosmas.cz) which, with more than 100,000 registered customers, is one of the largest booksellers on the Czech internet.